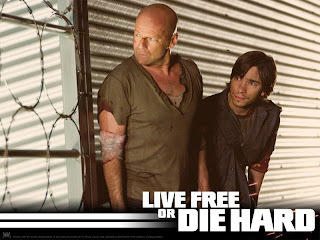 As the Live Free or Die Hard release date nears (June 27th), Bruce Willis is doing more and more press. At a press conference for the film, he talked about the possibility of doing another film in the popular series. Go to Latino Review for more comments from Bruce. So, not only has he possibly spoiled the film for us, I just read somewhere that the film will be Rated PG-13. I guess we will finally find out who this Mr. Falcon is that they refer to on the TV edited versions of the film.